Preheat oven to 200C/fan 180C/gas 6. Tip the filling ingredients into a large bowl and mix together with a wooden spoon. Pour into a large dish and cook in the oven for about 45 minutes, stirring regularly. While this is cooking, line a 23cm springform cake tin with shortcrust pastry, making sure that you have enough spare for the lid. 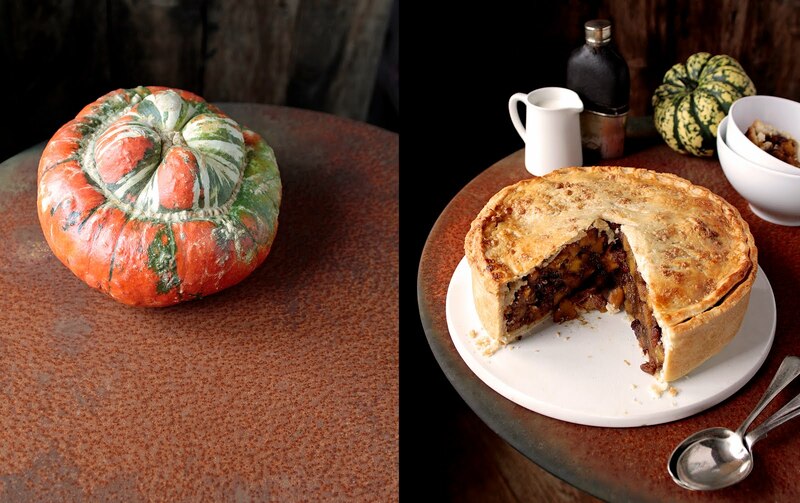 Add the pumpkin mixture to the lined tin, cover with pastry lid and pinch round the edge to create a seal. make a couple slits in the top with a knife. Brush with milk, sprinkle with muscovado sugar and bake for 30-35 minutes until golden. Allow to cool for a bit before removing tin.